Located on the banks of the Godavari, Nanded is deeply associated with the life of Guru Govind Singh, the last Guru of the Sikhs, who breathed his last here. Hence it is not without reason that Nanded, administrative headquarter of the district of the same name in Maharashtra, is a famous sacred destination for the Sikhs. 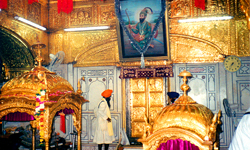 Presence of several gurudwaras like Mata Sahib Dewa, the Bandaghat Langar Sahib, Maltekri Sahib, Shikar Ghat Gurudwaras , Naginaghat Nanak Puri and Sangat Sahib in and around the city has eared it the epithet "City of Gurudwaras". The place is also home to Siddheshwar Mandir Hottal and Sufi shrines making it a spiritual destination for people of other faiths. Today Nanded is emerging an important commercial centre too and serves as the most convenient base for exploring the various places of interest in the district including Sahasrakund waterfalls. 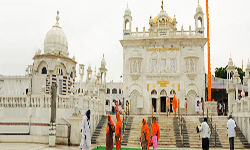 One of the five "Takths" or seat of authority of the Sikhs Takhat Sachkhand Shri Hazur Abchalnagar Sahib is the focal point of any visit to Nanded. Built in 1837 by the great Sikh ruler Maharaja Ranjit Singh, the Gurudwara is located on the place where Guru Govind Singh breathed his last here. His mortal remains are lying in the Gurudwara which is also know b for its architectural beauty in the forms of attractively carved marble pillars, embellished floors and a dome decorated with gold leaves..
One of the well known tourist attractions in the Nanded district, Hottal is known for the Chalukyan era temples including Siddheshwar temple, Mahadeva temple, Nandi temple and Parashurama temple. Built in Hemadpanti style of architecture, these 11th century shrines were built by the Chaulyan rulers of Kalyani. Earlier called Pottal, Hottal is 95 km from the Nanded city. An important sacred place, Mahur is considered to be the birthplace of Goddess Renuka - mother of Lord Parshuram. One of the three and half Shakti Peethas (temples) in Maharashtra, Mahur, 126 Km from the Nanded city, is home to other temples including the Shree Datta Mandir, Dev Deveshwari Temple, Anusuya Mandir and Sarvateerth. The ruins of the 12th century Mahurgad Fort or Ramgad Fort are the added attraction of the place. 79 km from Nanded city, the breathtakingly beautiful spot inviting spot where the Banganga River cascades is visited by people during the monsoons to enjoy the sound of gushing waters and the spectacular view of the verdant surroundings. Located in Biloli town in the Nanded district, the Masjid of Biloli was built of stone during the rule of the Mughals under its sixth ruler Aurangzeb who deied in 1707 AD. The Mosque is also known as Hazrat Nawab Sarfaraz Khan Sahid Masjid after the name of its builder, Sarfaraz Khan, an officer in the Mughal army. Famous for a Shiva shrine, Unkeshwar is visited by people for its hot sulphur spring believed to contain medicinal properties and potential of curing different kinds of ailments. The water temperature remains a constant 42.20 C.
130 km from Nanded city, Kinwat Wildlife Reserve attracts wildlife enthusiast for its large varieties of species. Occupying an area of 138 sq. 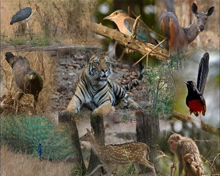 kms, Kinwat Wildlife Reserve is home to tiger, blue bull, panther, sloth bear, chital, sambar, chinkara, wild boar and barking deer. There are a good number of hotels in Nanded catering to the need of every customer. Hotel Chandralok, Hotel Nirmal Palace, Hotel Surajkunwar, Hotel Uma Executive, Hotel Taj Patil, Hotel Anuradha Palace, Hotel Guru and Hotel Nagarjuna are some of the accommodations options available in the city. Accommodation facilities can also be availed at the Gurudwara. Air: The city's airport is connected by flights from major cities like Mumbai. Aurangabad is the nearest airport which is 277 km from Nanded. Rail: Nanded is a major railhead connecting several important cities and places in India. Nandigram Exp connects Nanded with Nagpur, Mumbai and Aurangabad. Road: Nanded is connected by good motorable roads to different places in Maharashtra. Nagpur, Pune and Hyderabad are 379 km, 507 km and 286 km from Nanded respectively.